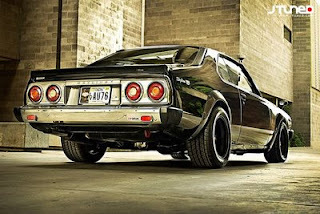 JTuned just posted up an artile on a 1977 Nissan Skyline. Old Skool , Classic. Older than a lot of people I know, not older than me though. The 1977 Nissan Skyline 2000GT-EX dubbed the GC210 was produced from 1977 to 1981 in Tochigi, Japan after Nissan dropped the GT-R line (only to return with the introduction of the R32). While not the turbocharged all-wheel drive monster that comes to mind with the name Skyline, this GC210 still proves itself formidable with a L28 engine bored out to produce 2.9 liters of displacement. After 32 years John Oshima’s 1977 Nissan Skyline 2000GT-EX has proven itself tough enough for the test of time, rightfully reminding us all of the Skyline’s “Godzilla” alias. Check out the rest of the photography over at JTuned.